Foto: Jens Ziehe © VG Bild-Kunst 2004 Eva Grubinger’s Netzbikini of 1995 addresses the internet’s collaborative potential. She makes available patterns and directions on a website and calls upon the users to sew a copy of the bikini - preferably with web fabric. Those who send the artist a photo of the piece of clothing are sent a label in return as "thank you" that designates the bikini as a genuine Grubinger. In this way, Grubinger counters the discourse of digital disembodiment with the physical labour of sewing and putting on clothing. Nonetheless, documenta 10 was also the site of the “First Cyberfeminist International”, which was organised by the Old Boys Network group. About 40 women artists, activists, hackers and theorists from Eastern and Western Europe, Australia and the USA gathered in Kassel to discuss the ways in which the new media were changing gender constructions. The participants debated the underrepresentation of women in this context as well. For many women, this was an important personal validation: we are here and have something to say! 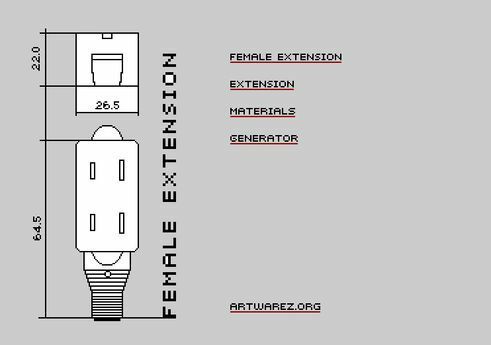 Cornelia Sollfrank | Screenshot of the documentation Website Female Extension (1997): http://artwarez.org/femext/ | © Courtesy Cornelia Sollfrank In 1997, Cornelia Sollfrank’s work Female extension drew attention to the invisibility of women in web art in Germany in an original fashion. Sollfrank, who was also the initiator of the Old Boys Network, took a contest by the Hamburger Kunsthalle as the occasion to create 288 virtual female women web artists, complete with names, email addresses and automatically produced artistic works, and to submit “their” works to the contest. The Kunsthalle was delighted by the high participation by women, but the awards went to men. With her hack, Sollfrank made visible the homogeneity of the digital art scene - a state of affairs that to this day has changed only gradually.